Allow me if you will to describe a situation that would send most of us running for the hills. 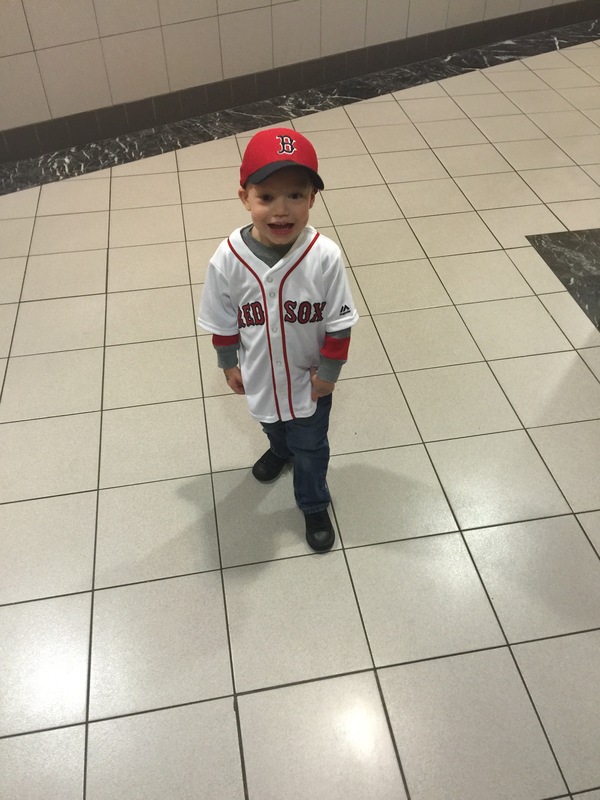 Taking a two year old to Fenway park to watch a baseball game. End of horror story. However thats exactly what the Ganger did on the 15th and 16th of June, and it was one of the best decisions I ever made. This was not a nightmare it was an adventure. I was made into a Red Sox fan in 2007-2008, during my turn at OIF, by a friend of mine who may not want to be named, so for posterity’s sake we will name his rank and initials. 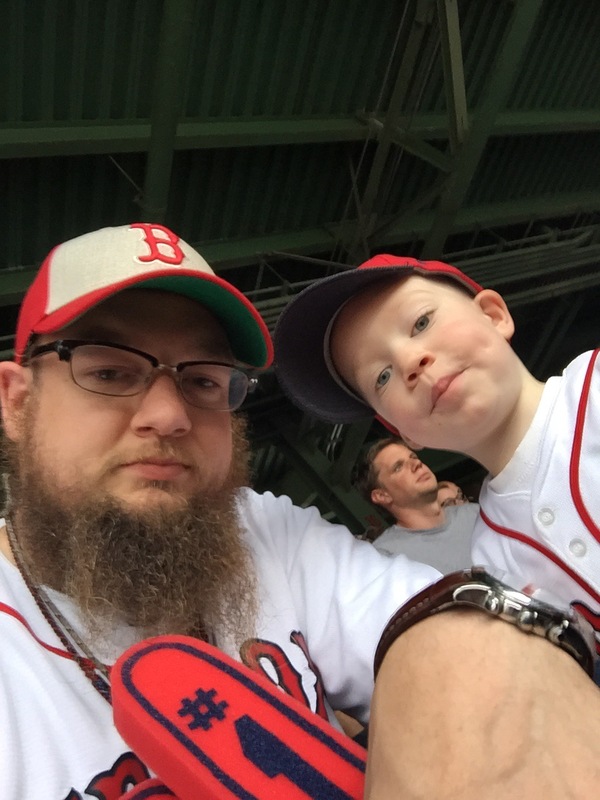 SSG JDG taught the great way of the Red Sox to this Braves fan and turned him. Maybe not an immediate turn, but now it is. I have followed this team since I came back from Iraq, and as luck would have it now we live well within driving range of Boston. As soon as we found out that we were moving here the Ganger took out his little Moleskine notebook that contains the bucket list and circled the one that said “take Liam to sox game at Fenway” and made sure to circle it. Now I can fill it in as completed. There are a lot of things to complain about when you prepare to go and visit this great shrine of the America’s past time. I don’t care what anyone says Baseball is the American past time. Football ceases in February, where as Baseball season happens to contain THE 4TH OF JULY!!!!!!! Why? Because Baseball is ‘Merica that is why. Right up there with old fashioned Dairy queens, not being able to properly play rugby, moon pies, The Simpsons, and Die Hard, Baseball is the American past time, and Fenway is the holy grail of stops. Along with Yankee stadium and Wrigley field there is just a list of places a baseball fans, if given the chance, must go. However being a Red Sox fan Fenway is it, it is the top of the mountain, and when you get to the top you will see that it is good. Beware, you will want to come back. I intend before I leave the North, to go to Yankee stadium as well, most likely wearing Red Sox gear, and if possible to watch them play the Sox. On that same not I intend to turn over the money for a ticket to watch the Sox and Yankees at Fenway. As I mentioned before I was a Braves fan originally. The Ganger realized that on the 15th and 16th the Red Sox would be meeting the Braves at Fenway for the first two games of a series. I bought tickets challenging the predicted rain to come and get us. With that said I bought us tickets for covered seats incase the rain made good on the threat. Liam and I made the trip with our own vehicle. We were on our way to one parking garage when we encountered one that had seventeen dollar Red Sox parking so long as you turn in your game ticket when you pay. Being the Ganger we were going to hoof it the one mile to Fenway, however Liam spotted one the “pedi cabs” where a guy with a bicycle hauls you in a cart with an open fare. Liam thought this was a great concept and wanted to ride the bicycle so we took this to the park. When you see it, when it falls into your view, the excitement will become something tangible. Like I said there is a lot to complain about, I was not kidding. Be it the crowds, the prices, the extra little fees they build into the price of a ticket, the people who stand in the beer line with a beer in their mouth with four empty cups on the bottom of it waiting for more and then are sitting near you? Yes you could complain about these things, but they are a part of the experience. They are what makes up the entire experience that is a game at Fenway. Taking a two (almost 3) year old who’s favorite phrase is currently “NO! let me walk please?” through that mess is just exhausting to think about. What I like to sit back and think about is that I am fortunate to be able to take my son to ball games. All those things I listed are quite the problem to have right? Liam loved the experience, he had so many firsts with this. He had his first baseball game, which is also his first Red Sox or Braves game, first cracker jack, first sprinkles on his ice cream (in the little Red Sox helmet), first pack of base ball cards, first baseball jersey (which we ran to get matching ones on the way), and first jerk who catches the ball that the ball boy points at you for, but of course it falls short and despite the extreme booing of the entire section the jerk will not give it to your son who was clearly pointed out by the ball boy. I would beat whole sale A** over so much less, however Liam was in no way aware that he was supposed to get that ball so his feelings were not hurt. We left it alone and the dude left early because the section refused to allow him to enjoy the game. I made sure that he left with a game used Red Sox ball. Not from that day, but he got one. 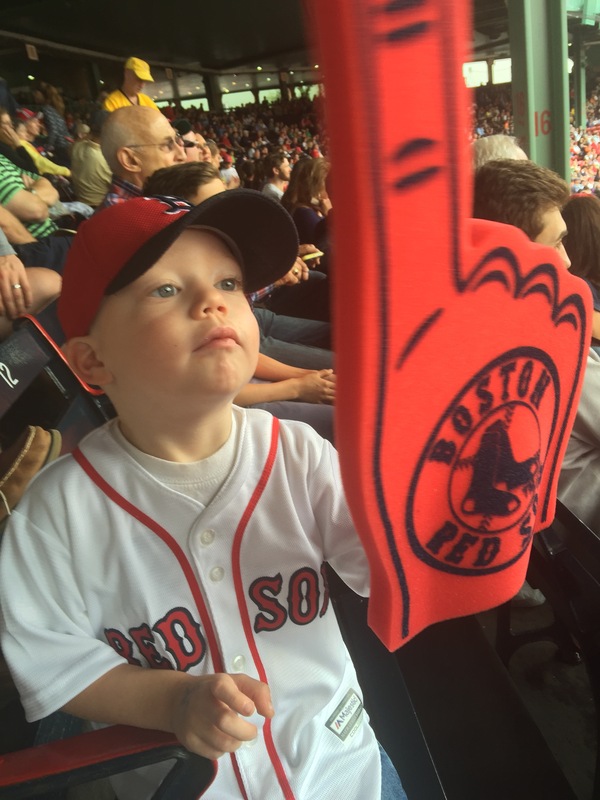 Liam got into it, one woman had two kids, both older than Liam in her lap looking miserable, Liam is standing in his chair, big foam finger on (our sporting tradition), yelling at the pitcher to “THROW BALL” and chanting “lets go Red Sox” with all of us. The Red Sox were defeated, but we enjoyed ourselves and got home late. 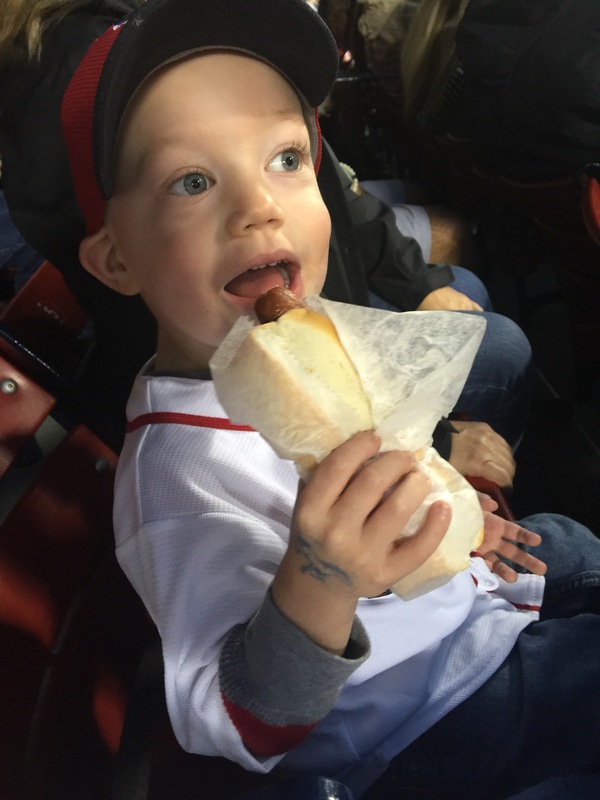 Liam had destroyed a hot dog during the game so all he wanted was some milk and to watch Toy Story despite it being midnight. As I tucked him in he said “thank you taking me ball game.” When a two year old is touched enough to thank you for something that is not immediately present any more and hasn’t been for a couple of hours, that means it really meant something to them. I asked him the next day if he wanted to go the next day expecting him to tell me no. I should have been cleaning house. 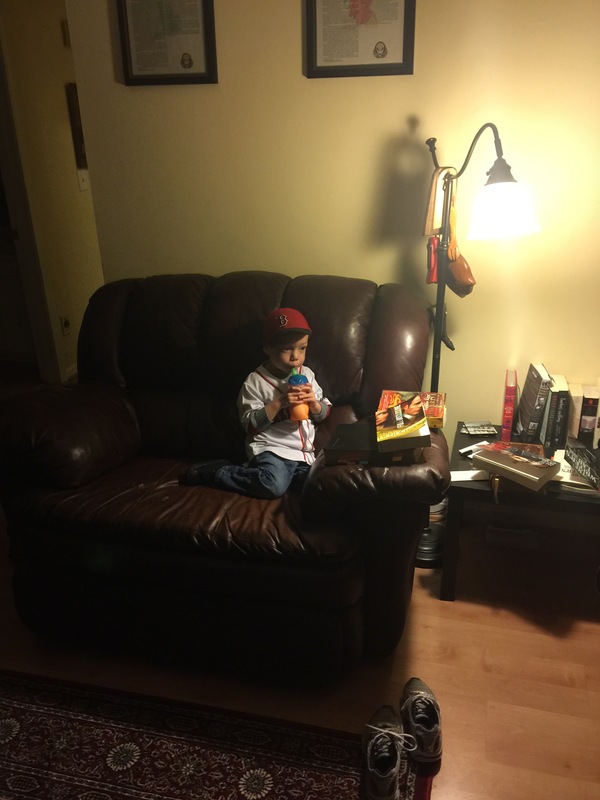 He ran out of the room and came back in with his Red Sox hat in tow. The was enough for me. Ticket purchased, and on the road in no time. 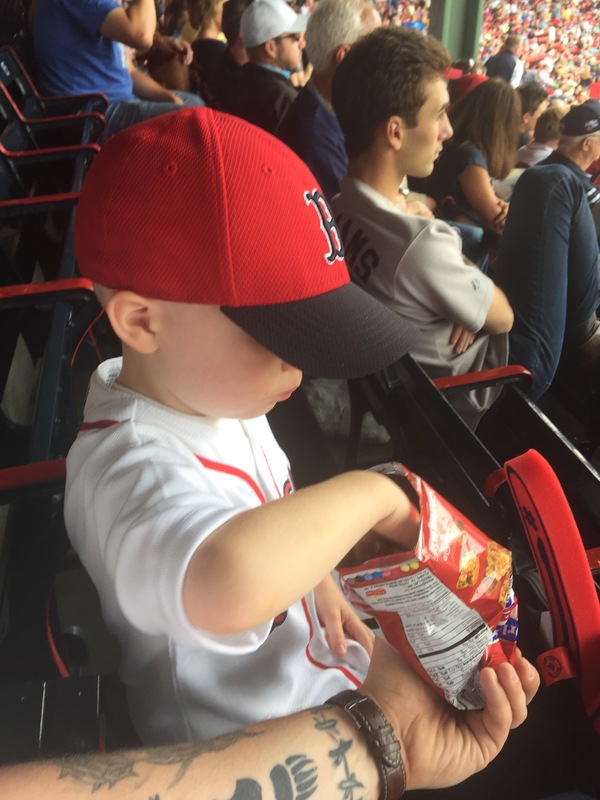 He took a short nap in the car, before that I asked him if he wanted food and he said “at the Fenway?”. This game was a thriller, the Red Sox steadily beat the Braves, with plenty of action. The ice cream, sprinkles, and hot dogs were top notch. The crowd was just as electric as before. Liam had just as good of as time shouting and dancing to music. 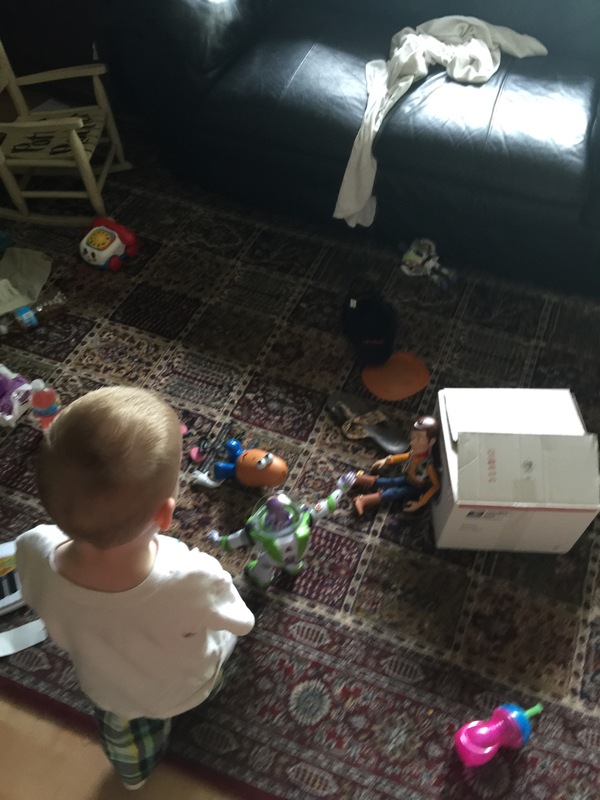 I am a creature of habit, and my son is becoming the same. 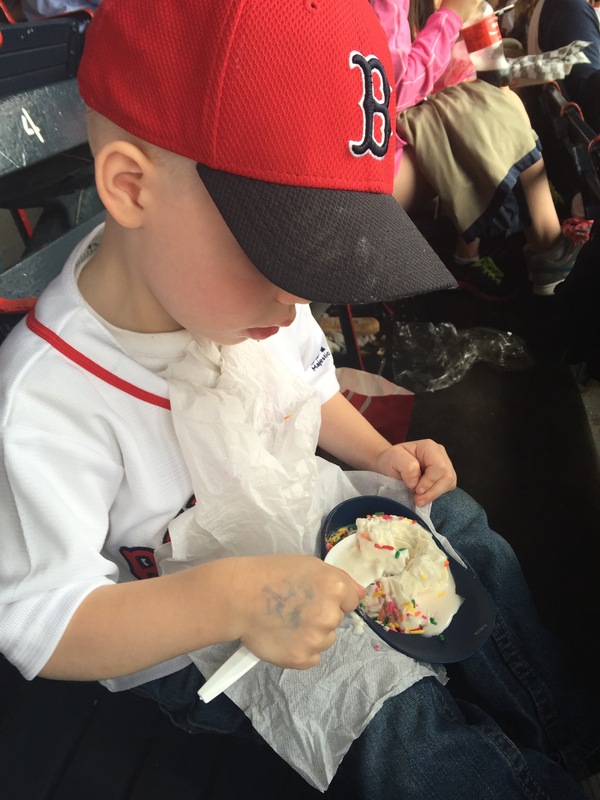 Now we were our Sox hats, black converse, jeans, and white jerseys and we bring home an ice cream helmet. Liam, already knows which shoes to go get. 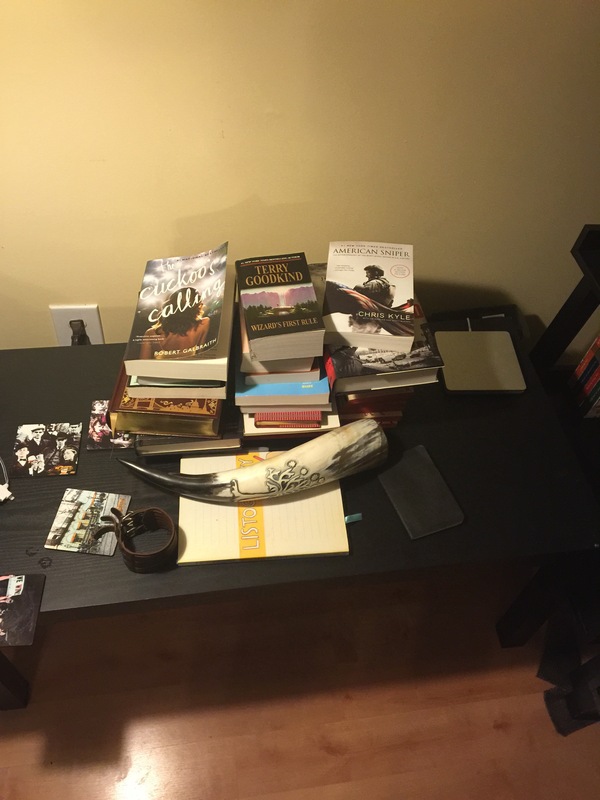 We have a small collection of items, if you reference the first entry you will know that I build time lines out of things. Liam has a game used ball that we bought on the first night, and now I have a game used ball from each of the nights we went and our souvenir cups and ice cream helmets. I do not know when we will go back, but I do know this. Moral of the story: Your time on this earth is limited. If you have kids, you should be acutely aware of just how limited your time is. I was aware of this fact even before I had a son, but Liam made sure to remind me. If you know the Ganger on Facebook then you know that we have another little one on the way. 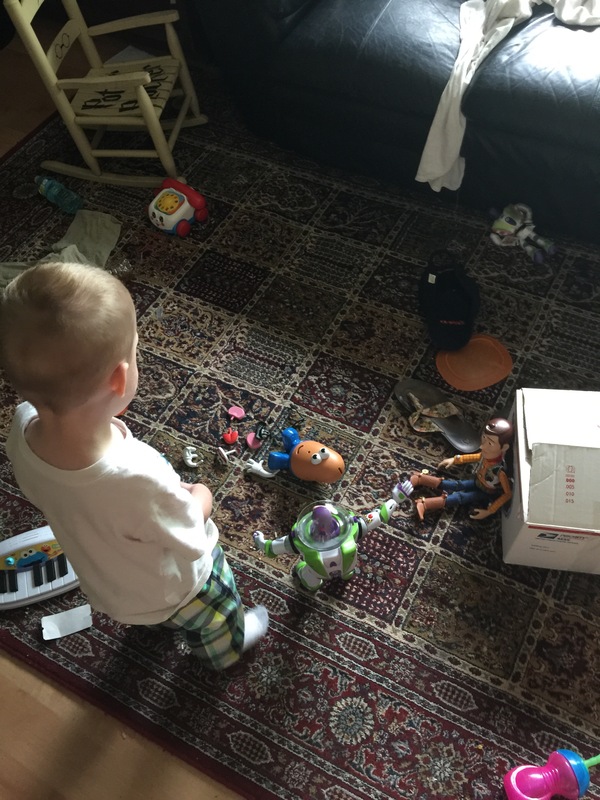 I am aware of how little time I have with my son, if I get all of it. I want to make sure he knows that I did things with him that I passed on the things I love to him, that getting him to a game and watching it with him was more important to me than anything else. On the way home from the second game he told me again “thank you going ball game with me.” I feel that it had served its purpose in that moment, that if nothing else one day my son will know that at least twice we spent a few hours at Fenway. as promised our ghostwriter has left something for us. I have agreed to post what hey give us with them retaining full control. Enjoy and I’m sure the ghostwriter would enjoy some feedback, thank you. She is alone in her thoughts. She wants to kiss them, to hold them close. A part of her will die tonight, she does not fear this death, she welcomes it. The Ganger is finally back. I’ve got myself spread thin as per the normal. 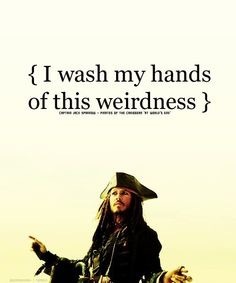 I do not have a large great post ready to go, however I do have some fun planned. First and foremost this Saturday at noon Team Minuteman will be gathering in Plymouth MA to take a little walk again. The Ganger loves going for walks, especially ones that involve good people, horns, hammers, and armor and good old honesty. The honesty I speak of is the pain of some out OUR veterans and their families. It is a beautiful thing that goes on and it is amazing to see the support. 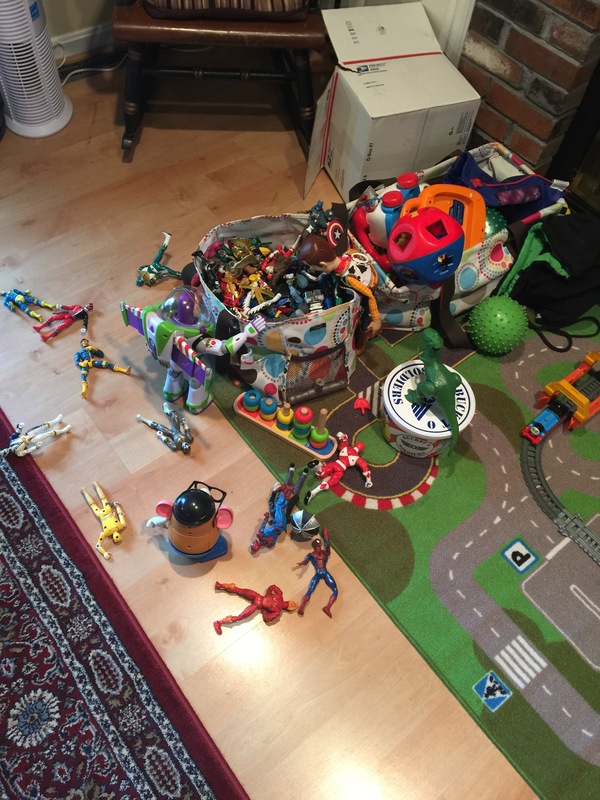 Second, I saw a post a week or so ago where some parents had been making their children believe that the dinosaur toys had been coming to life and creating mischief. 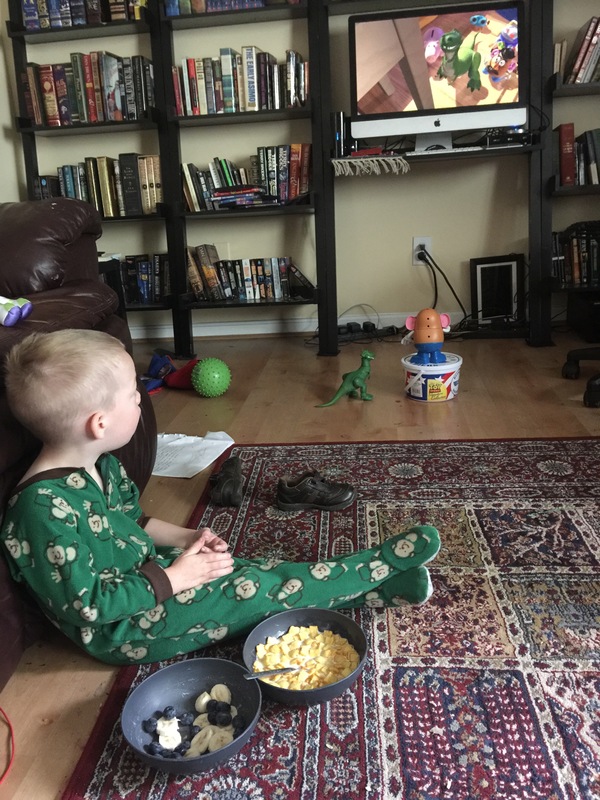 They did this to preserve their children’s sense of wonder and imagination during an age filled more and more with external stimulation that doesn’t even require reading. I decided this elf on a shelf like idea was a great one. Not to be outdone I didn’t steal the idea entirely. See with Liam I have been teaching him things myself and his mother both love, we have been doing pretty good. 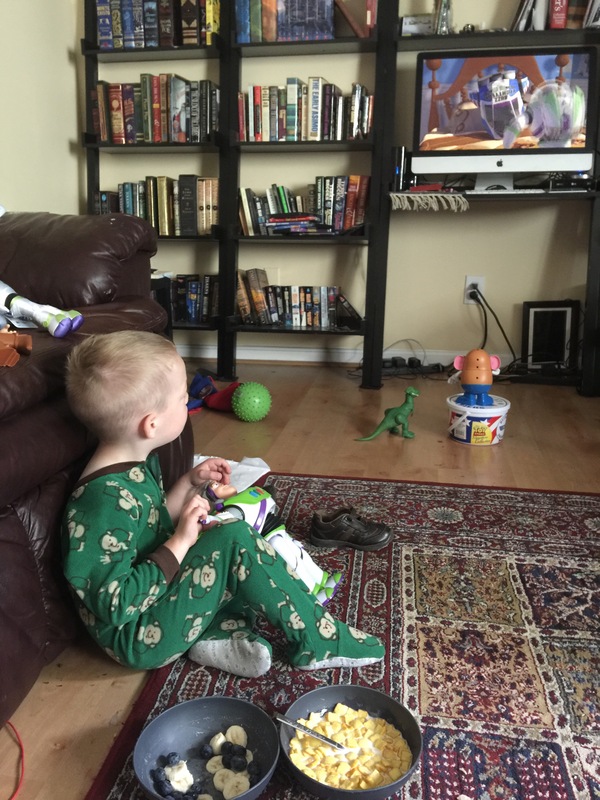 His interests are scooby doo, muppets, Peter Pan, peanuts, comics, and toy story. 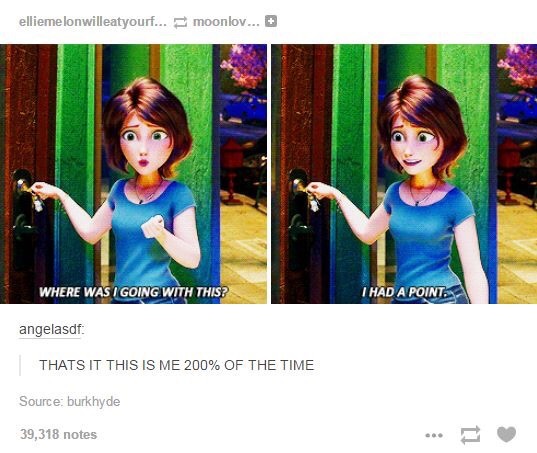 I love toy story in a way that it almost demands a post all to itself. Maybe it will get one when I decide to fully open the babbling flood gates. 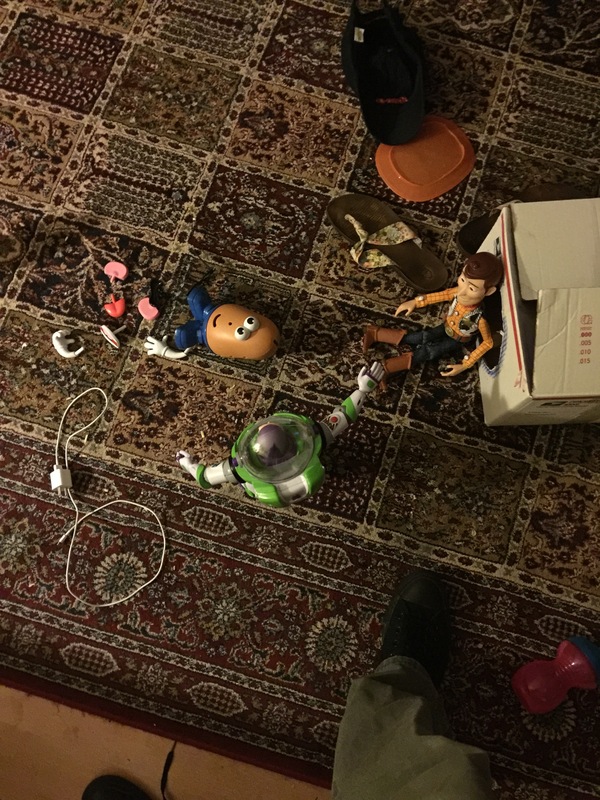 Any how, yes I went on a toy story quest. Here is my process to this whole thing. Give them to the child so that they are aware of them. Make a page of ideas for them. 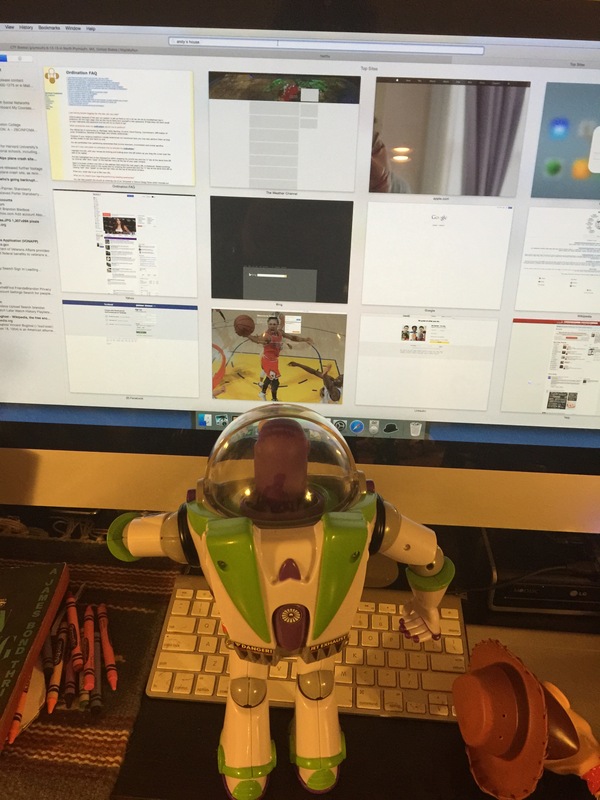 So you can do this with things your children have already, but I decided to go with toy story. Here are the first few goes. Next was the toys performing potato head surgery. i have no idea what happened to potato head to where he needed this help??? I have no idea, but it seemed traumatic. 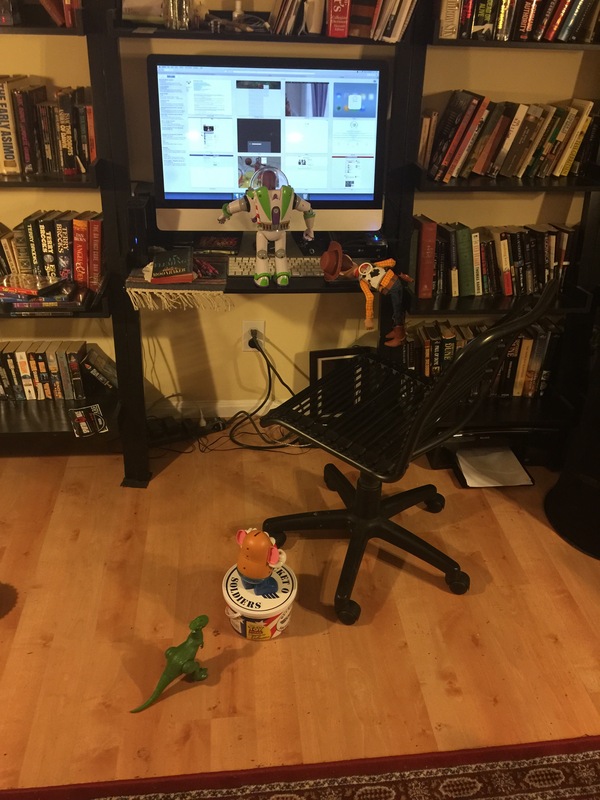 Next Buzz and Woody were spotted searching through a large bag of action figures for villains, potato head and rex in close support. Not a lot else has gone on. Like I said Carry the fallen this Saturday. If you are interested search Facebook for Carry the Fallen Plymouth. Register and raise some money. Weekend after that on the 20th is the first of this seasons Spartan races for the Ganger this season. Training has been slow, but promising. I have been improving the home gym as we go and using it as best as I can. My favorite tool of course being the good old fashion Russian Iron Kettle bell. The most fascinating piece of news that I can give you, if you have stayed with us up until this point. I can tell you that the Ganger has stumbled onto a ghostwriter. This ghostwriter has a story to tell and is going to allow the Ganger to tell it here, so I am going to be working on promoting some, whats the point of a blog if no one reads it, especially when another person is depending on this site for their story to be heard. first post from the ghostwriter will show up soon. Dairy Queen, zen in a cone. As you may or may not know the Ganger is from the south. I like that about myself. I like to think I can fit in just about anywhere I choose, and I had a great many assumptions about moving up north. When we did come up here we did not end up living in the town we thought we would instead we moved a couple of towns over and fell in love with Marlborough. In Marlborough not only were we able to get a nice sized town home for what a tiny apartment cost in Natick, but we crushed an assumption. Small towns are not found just in the south, in fact the quintessential small town has been spotted up here more than in the south. Dairy Queen, in my opinion, should meet some standards. 1. Have almost no parking. 2. Serve little to no actual food. 3. You should be able to walk there. 4. It must close in the winter. When these places hit in 1940 it was a big deal. Get that image in your head, there were soldiers in WWII who probably thought about Dairy Queen from their fox hole. There may not have been many, but when you miss home you miss little stuff. 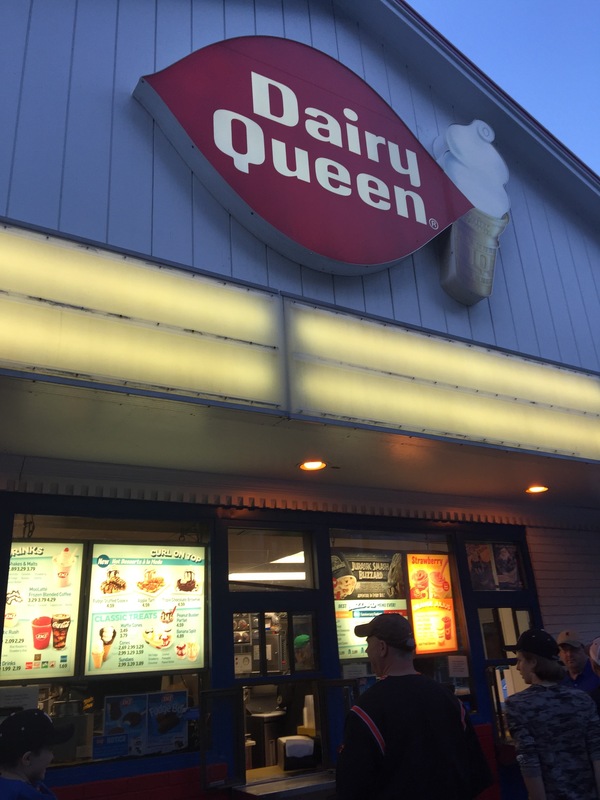 We have a Dairy Queen back home but it is a friggin eatery. It is an utter abomination. More food on the menu than anything. We get here and there is a beat up little building with windows in the front that serves ice cream! To top it all off they added one food item this year, hot dogs, ‘Merica on a bun, and the town went nuts. Excellent, this is as it should be. Even better this place is only a couple of miles from the house. This is a thing we do now, we eat dinner, and every so often we throw on our converse and stroll to the Dairy Queen. We order ice cream something’s and we eat them there. We walk home. End of story. Clean family time. People say America has no culture? EAT ME. This is a part of it. 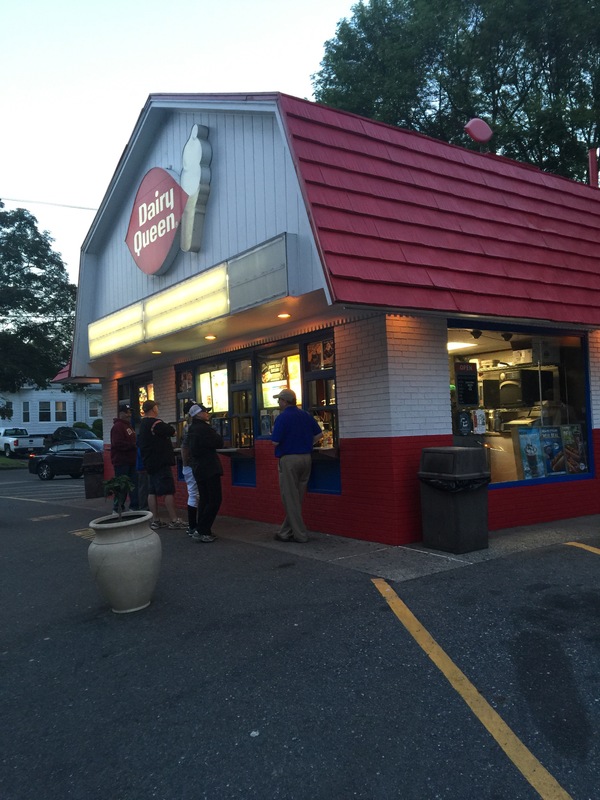 Love it or hate it Dairy Queen when found in this form is small town America. It is the 50s coming back for a visit. I swear I’d go three times a week if that dude would blare 50s music on the speakers. To make it beyond awesome the owner hires high school kids during the summer and allows them to collect tips for a certain school cause. Last year it was the bands trip to the capital. This little slice of heaven reminds me it’s not so bad. It may sound stupid to you, but to me it is a beacon in the dark. **DISCLAIMER** Long, winding, tedious thoughts of a veteran ahead. Read at your own risk. Suggested reading music: Glenn Gould’s The Goldberg Variations 1981 recording. So after the other nights post I decided it was time for something written with a mild amount of mania, but no alcohol and with as little whining as possible. The entire point of this is to spit out anything that comes to my mind rather than keeping it all to myself, no matter how much I hate the thought of someone reading it. This entire blog is basically an exercise in rolling around on the floor thrashing. Anyhow, I wrote this post the other night, and despite hitting the save as draft button I lost it. The second attempt here will probably be much shorter as I hate to re do work. Tonights topic is the paperback book. The paperback book is one of your very best friends. It can fit in your pocket in most cases, and true to its original purpose when it came out in the late 1800s it is more affordable than the hard back book. If you have ever been to my home then the first thing that you will notice is that we love books. Bibliophiles to the core, well it is probably the fourth thing you’ll notice if you go about this spatially as the tea shelf, china cabinet, and kitchen are all before you would ever reach the books. However this fourth thing is a great one. A good friend of mine visited my house recently and while lamenting that he did not read more, also said that my pile of books to read before the next semester of school starts was “ambitious.” Coming from him I will take this as a great compliment because I have never heard him say that a goal was too large until I proposed that we ruck The Great Wall of China. I love books so much in their paper form that I even keep a current dictionary on hand, something people often mock. Victory is mine however as I just successfully used that dictionary in double checking the difference between to and too. Take that nay sayers. Back to the point, We love to read. Reading, in my humble opinion (unless you know me then you know it is not humble in the slightest) is the first and most fundamental skill of a free people. Literacy is a weapon. The Nazi party burned books, certain unnamed religions have in the past (or right this very minute) use the lack of literacy as a way to make sure their minions do their bidding. I believe in freedom, and people like me thumb their nose at the idea of burning or banning books so thoroughly that we set up a table at libraries specifically so that previously banned books are very easy to locate. Let us come back to our friend the paperback. It was meant to make books more affordable. All authors want to be read. Yes they make money and plenty of them love the money, but at heart they want their work to spread like an uncontrolled wildfire. Some of them have such an established audience that they will write a crap-tastic book in the middle of an awesome series, inserting some social issue they care about, I call this a soap box book (cough James Patterson cough.) The paper back was in a way the Realization of the ideas of those like King James I, The dream that more people could read the Bible for themselves and so with the creation of an English version (the third actually approved by the English church authorities however apparently the puritans wanted something more accurate) of the Bible came the push for greater literacy. Whether you love the Bible or not, it is the center of literacy for the English speaking world. Even the first widely used schoolbook in America, Noah Webster’s A Grammatical Institute of the English Language or the “Blue Backed Speller” more commonly, which Webster made to improve schools and education in the Republic was a combination of Biblical morals and Republican ideas meant to make good citizens out of children. Enter all these years later our friend the paperback…someone please help me to stay on track! The paper back meant to spread books further for less was a massive success. 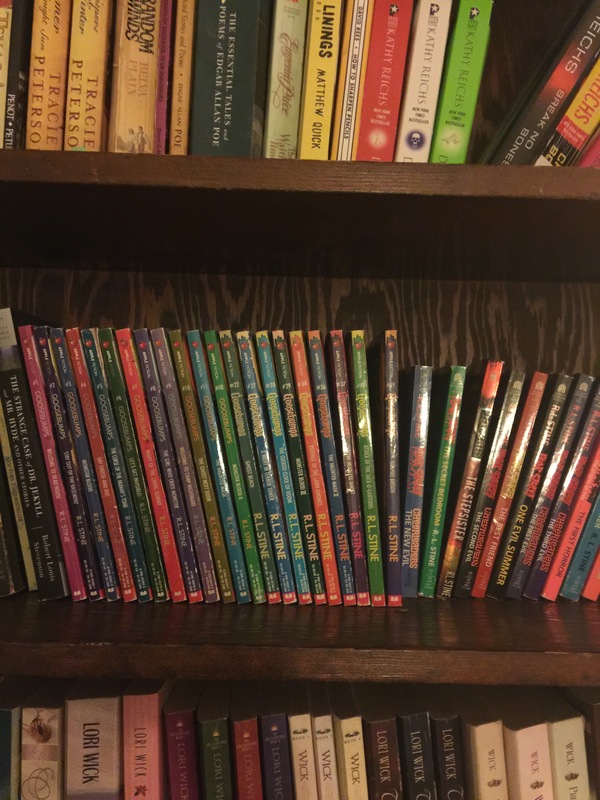 Think back to your school days, those glorious shelves filled with beaten and worn copies of some of the best classics for whatever grade you happened to be in. Now in some cases nothing to me is worse than and obscure and old book (those crazy books in antique stores that are the leavings of once respectable collections picked over until all that is left is something no one has heard of ever) but with the school paperbacks all of my senses are brought to life. I remember specifically a copy of Charlie and Mr. Willy Wonka, Matilda, and later in high school finding my second copy of The Count of Monte Cristo on a worn shelf in my creative writing class. , their yellowed pages, cracked spines, covers missing pieces, dog eared pages (not a practice I support but a sign the book was read at least partly) possibly a pencilled list of previous owners, and best of all the smell. I personally live by the nose (my eyes are not so great.) I believe that no sense can be linked as closely to memory as the sense of smell and we all know the smell of good old paper back, If I made a yankee candle out of it I would call it “Library” or maybe more on the nose “old paperback.” I like the smell of new books too, and I detest the moldy smell of a book that is old but uncared for. Right now my paperback of choice is some very old Signet copies of the Ian Fleming James Bond novels. These books are great and despite the fact that I have to tape these antiques back together after just one read I find their vintage to be far superior to that of a new copy. 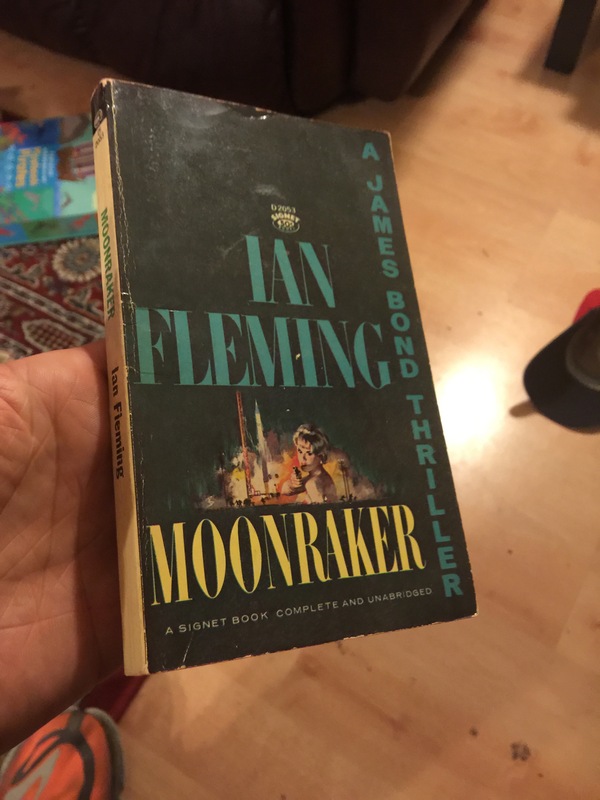 There is a wonderful store a few towns over, Bearly read books, well wonderful when you find what you are looking for, but this is simply a side effect that they have many treasures to hunt through, and they always have the vintage James Bond I need for my collection. 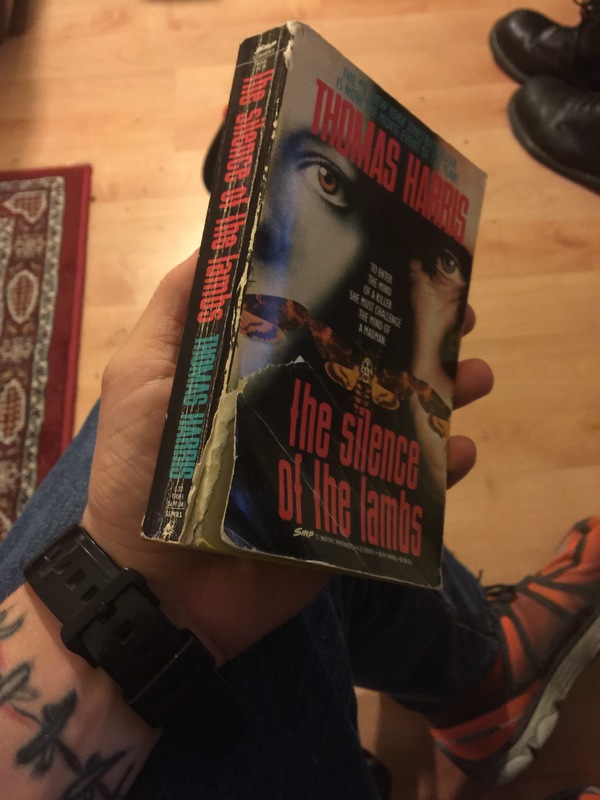 If I had to describe my very favorite paperback in my collection, I would say it is my 1991 The Silence of the Lambs. It is the edition put out to promote the movie. I bought it at Mckay’s used books in Chattanooga Tennessee when I was sixteen and it has been my constant companion ever since. It is in desperate need of some love and I may have to break down and do some repair work soon. Now that you have read this long and tedious mess what is your favorite paperback?